The acting throughout was faultless. 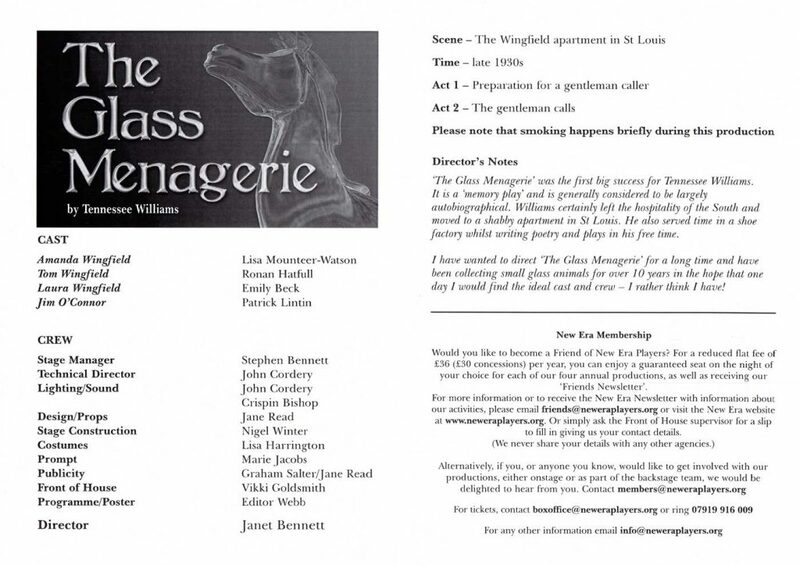 New Era Players: The Glass Menagerie, at New Era Theatre, Wash Common, on Thursday, March 15, to Saturday, March 17, and Tuesday, March 20, to Saturday, March 24. 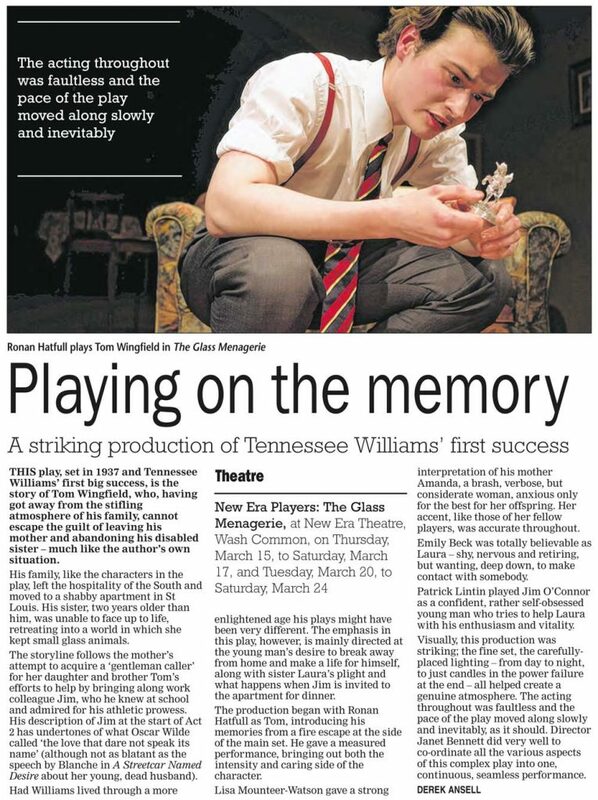 This play, set in 1937 and Tennessee Williams ’ first big success, is the story of Tom Wingfield, who, having got away from the stifling atmosphere of his family, cannot escape the guilt of leaving his mother and abandoning his disabled sister –much like the author’s own situation. His family, like the characters in the play, left the hospitality of the South and moved to a shabby apartment in St Louis. 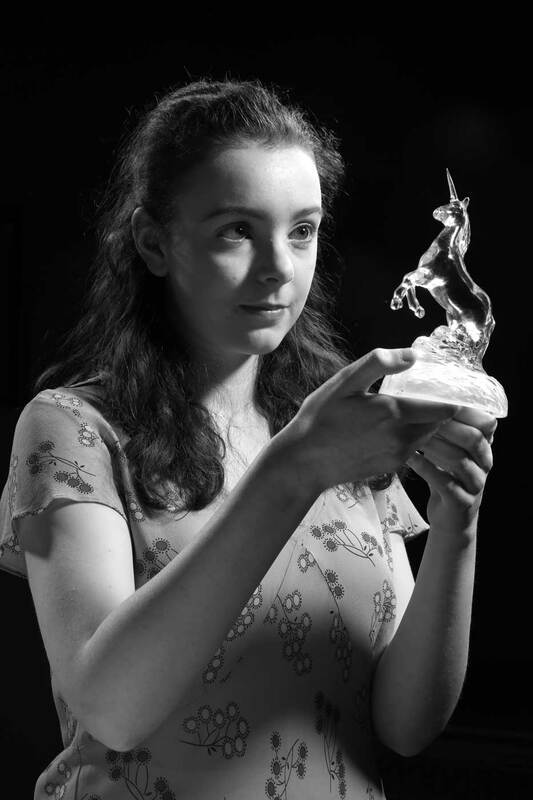 His sister, two years older than him, was unable to face up to life, retreating into a world in which she kept small glass animals. 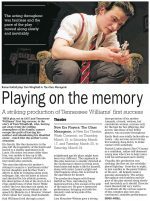 The storyline follows the mother’s attempt to acquire a ‘gentleman caller’ for her daughter and brother Tom’s efforts to help by bringing along work colleague Jim, who he knew at school and admired for his athletic prowess. His description of Jim at the start of Act 2 has undertones of what Oscar Wilde called ‘the love that dare not speak its name’ (although not as blatant as the speech by Blanche in A Streetcar Named Desire about her young, dead husband). Had Williams lived through a more enlightened age his plays might have been very different. 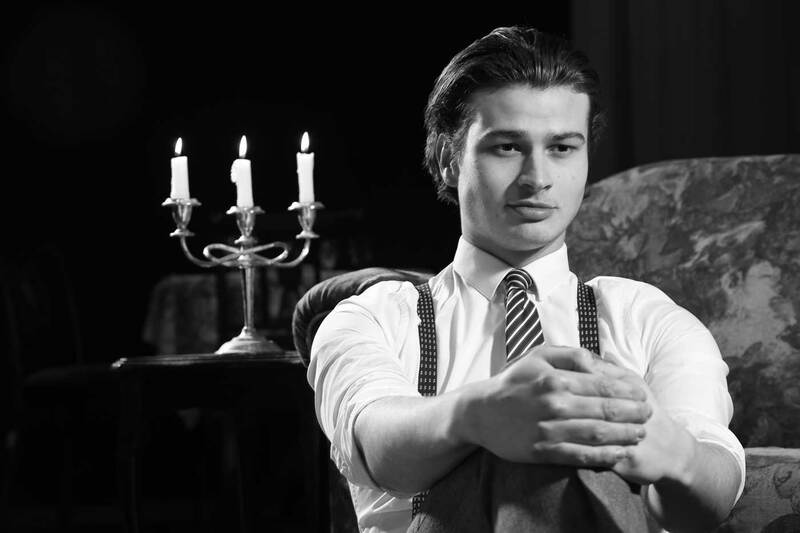 The emphasis in this play, however, is mainly directed at the young man’s desire to break away from home and make a life for himself, along with sister Laura’s plight and what happens when Jim is invited to the apartment for dinner. 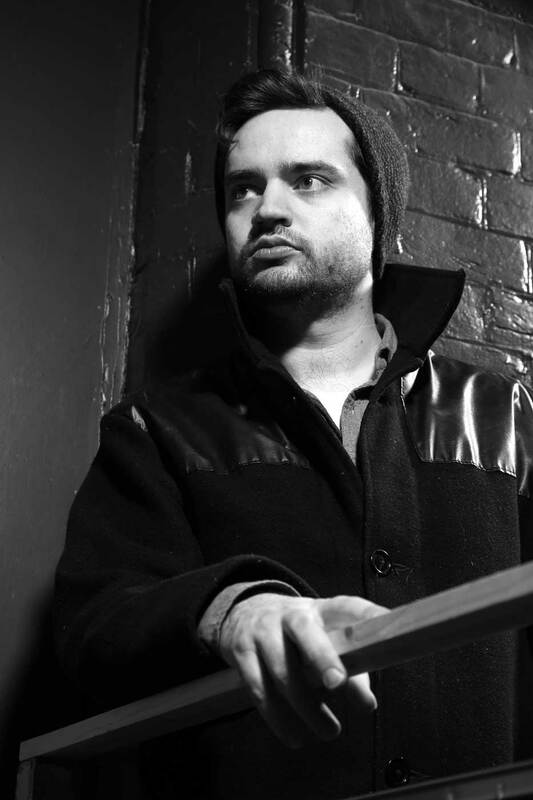 The production began with Ronan Hatfull as Tom, introducing his memories from a fire escape at the side of the main set. He gave a measured performance, bringing out both the intensity and caring side of the character. 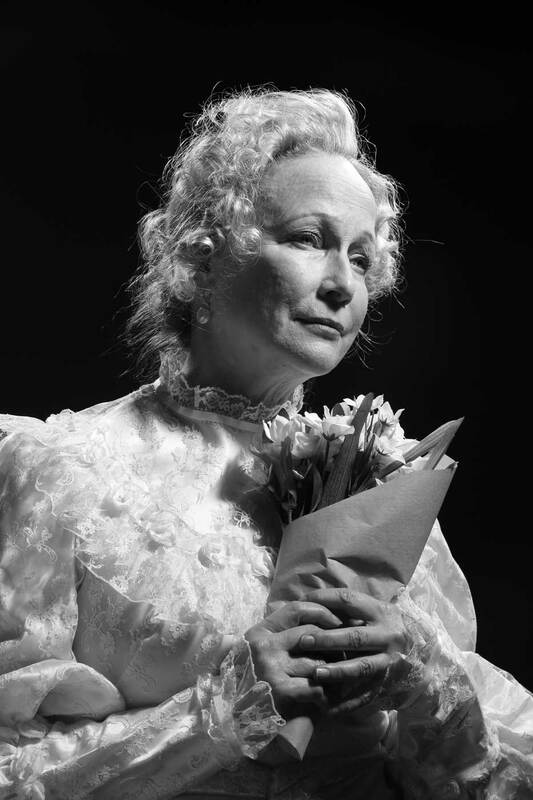 Lisa Mounteer-Watson gave a strong interpretation of his mother Amanda, a brash, verbose, but considerate woman, anxious only for the best for her offspring. Her accent, like those of her fellow players, was accurate throughout. Emily Beck was totally believable as Laura – shy, nervous and retiring, but wanting, deep down, to make contact with somebody. Patrick Lintin played Jim O’Connor as a confident, rather self-obsessed young man who tries to help Laura with his enthusiasm and vitality. Visually, this production was striking; the fine set, the carefully placed lighting – from day to night, to just candles in the power failure at the end – all helped create a genuine atmosphere. The acting throughout was faultless and the pace of the play moved along slowly and inevitably, as it should. Director Janet Bennett did very well to co-ordinate all the various aspects of this complex play into one, continuous, seamless performance. 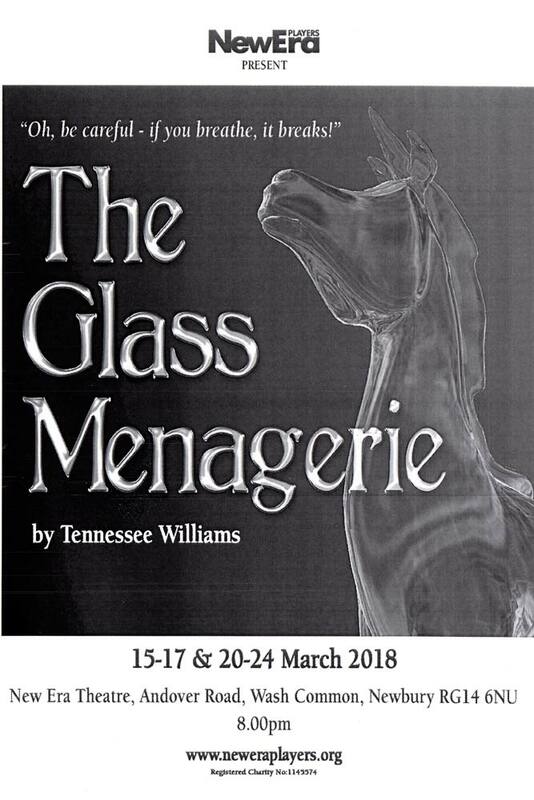 The Glass Menagerie starts off as Tom, the main character, recalls his memory of living in a tiny run-down apartment with his sister Laura and his overbearing mother Amanda, years after they were abandoned by their alcoholic father. The family is struggling to get by and is living off of Tom’s wages from working at a shoe factory. Tom’s memory of his mother is mainly of her dominating his life, and we watch him become overwhelmed by her constant demands on his everyday activities. Their mother Amanda is constantly reminiscing on her past as a debutante, when she was courted by all kinds of fine Southern gentlemen. Amanda’s recurrent nostalgia for better times puts pressure on both of her children to somehow make a better living for the family.